Now here's an interesting invention coming to the Shark Tank I know a thing or two about. Apparently eating raw cookie dough meant to be cooked is not good for you but it sure didn't to stop my Brother's and I from eating plenty of it as kids. One time a long, long time ago when you could buy sheets of pre-made cookie dough, my Mom decided to make a batch of chocolate chip cookies only to discover a perfect bite (teeth and all) already taken out of the cookie dough. Obviously, nobody confessed although I'm sure we all thought about it, so she lined us up and compared our teeth to the perfectly preserved bite mark left in the sheet of cookie dough. LOL, my older Brother was busted as there was no denying he was the one that took the memorable bite out of the cookie dough. 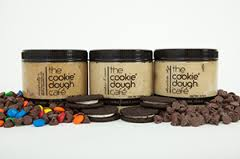 Cookie Dough Cafe Entrepreneurs who and sisters Joan Pacetti and Julia Schmid obviously share the same passion we shared for raw cookie dough, we just didn't turn it into the next Mega-Hit Shark Tank Product coming to a store near you soon. The Cookie Dough Cafe Brand is not meant to be cooked but rather eaten raw right out of the cookie jar. Currently it looks like there are three primary products to choose from including my favorite Chocolate Chip, Cookies & Cream and the Monster Cookie Dough which consists of peanut butter and lots of M&M candies. At a retail price of $6.99 per pint, the Cookie Dough Cafe Brand is not your ordinary cookie dough, but a whole new way to enjoy raw cookie dough that's actually good for you. I like this Creative New Specialty Food Product, I really do. But the more I keep thinking about the business plan sister's Julia Schmid and Joan Pacetti chose to grow the Cookie Dough Cafe Brand, the more I wonder why? After covering almost of all the Shark Tank Contestants that's ever been on the Show, this is the first time a Shark Tank Product that would be perfect to take advantage of the Shark Tank Effect looks to be going out of their way to "NOT" take advantage of this once in a lifetime opportunity. I understand the desire to grow at a wholesale level and get in as many grocery stores as possible, but in this day and age especially with a brand new specialty food product, doesn't it make sense including an online presence for impulsive buys? I can only imagine how many cases Cookie Dough Cafe could've sold this weekend alone if only they only had way for Shark Tank Fans to immediately support them. According to just about every page I visited on CookieDoughCafe.com, it says "We are unable to sell directly to customers, we are strictly wholesale." That's the bad news; the good news is the Cookie Dough Cafe Brand's already in dozens of stores across the country. If your local grocery store doesn't already carry Cookie Dough Cafe, no problem they have a form you can copy and take to the warehouse so they can order some for you. LOL, now how's that for getting the public involved putting a new product on the shelves? It's a rather interesting strategy I certainly hope Julia and Joan become very successful at, but I can't help think how much money's being left on the table during this critical part of the Cookie Dough Cafes growth. I'm assuming there's a good reason for this decision and hopefully, it will come out during their appearance on the Shark Tank Show. they have Shark help from two Sharks and is not very readily available. What a shame. The main reason for no online sales is that they probably would have to ship with Dry ice, which is very expensive. Probably around $100 for each overnight shipment, and that's before the added cost of Dry Ice.. That's why it would cost prohibitive to ship when the cost of shipping is so much more than the product. They wouldn't be big enough for FedEx or USP to offer shipment discounts yet. Oh No, I wanted to order for valentines day! it will be soon trust me working on it now. What about the hotel and stadium plans aired in the Shark Tank airing of this product.